Hi folks, here’s the first video from our CD release show for Roads & Codes last month at the Sound Room in Oakland. It was taken by saxophonist/video whiz Ben Torres. Due to some technical difficulties (not Ben’s fault) the trumpet is pretty far down in the mix, but I don’t think that detracts from the music too much. More to come! Also, if you’re in the Bay Area, I’m going to be playing tomorrow (Saturday, March 9) at the Cheese Board in Berkeley with pianist Betty Shaw‘s Quartet (with Ron Marabuto, Robb Fisher and myself), from 12-3pm. The pizza’s delicious and the music is free, so come on by! Hi folks, thanks to everyone who came out to recent shows in Berkeley and Oakland. I’ve got another show coming up in Berkeley at Caffe Trieste, home of an array of strange and wonderful coffeemakers worthy of Frankenstein’s lab. I’ll be joining bassist Noah Schenker and friends for an evening of straightahead cookin’ on standards, jazz classics, some originals and other rarities. Who: Noah Schenker, bass; Ian Carey, trumpet; Adam Shulman, piano; TBA, drums (but you know it’ll be somebody good). Happy summer! For those of you who weren’t able to make it out to our show last week at Coda, here’s the first video from that great evening (great for us, anyway–I leave the musical judgments to you). It’s the tune which has recently become our favorite opener, “Sockdolager” (ironically defined as “a decisive blow or answer : finisher”), as heard on Contextualizin’. It features solos from me, Fred, Evan, and Adam (getting his Rhodes on), with Jon’s tidal groove(s) washing over it all. Ian Carey Quintet – Sockdolager from Ian Carey on Vimeo. Not only was it great to be playing with these guys again, it was also encouraging that we got such a big, enthusiastic crowd out (you can’t miss them on the video), some of whom I think are a sign that the club is taking off–definitely refreshing to see after so many closures of jazz-friendly venues in the recent past. Currently, our next scheduled show as a quintet is at Berkeley’s Jazzschool in September, but we’ve got some feelers out for gigs between now and then so I’ll keep you posted. In the meantime, I’ve got appearances coming up with the amazing Circus Bella and the Contemporary Jazz Orchestra (formerly of Pearl’s and Rasselas), so it’s looking to be a busy, musical summer. BTW: if you haven’t yet, please take a minute to “Like” my jazz page on Facebook (“You like me! You really like me!”), or follow me on Twitter (which I’m really starting to get into, after years of stubborn resistance). Thanks, and stay tuned for some listening recommendations, more gig video, an upcoming radio interview, and some follow-up thoughts on the jazz funding debate. Cheers! Listeners: This is just a reminder that the Ian Carey Quintet will be returning to SF’s beautiful new club Coda this Wednesday night as part of their “Dinner & A Show” series, for our last scheduled show before September. It’s a great place to play, with good food, drinks, sound, and music (if we have anything to say about it). We’ll be playing lots of music from our new CD, Contextualizin’ (“a digital masters seminar” —All About Jazz) and our previous album, plus several brand-spankin’-new originals which will be performed for the very first time (and possibly the second time as well depending on how well the first time goes). So please come on down, bring a friend or 5, and support some live local music! P.S. For a preview, enjoy this video from our previous Coda show below (playing a reboot of a composition from our first album called “Thirteen”), and an interview about the group by Brian McCoy of Examiner.com. Ian Carey Quintet: Thirteen (Live at Coda) from Ian Carey on Vimeo. Hi folks–as you can see, the website has a new look (it was long overdue). Let me know if it’s working for you. I’m planning on doing some more regular posting in the future (beyond announcements and self-promotion–because, let’s face it, that gets boring), to share my thoughts on the jazz scene, the trumpet, what I’ve been listening to, etc. … RIGHT AFTER I get this self-promotion out of the way: first, I do want to mention that thanks to the great crowd that turned out for the CD release show, we’ve been invited back to Coda on Wednesday, June 16. I’m planning on having some new material ready to debut, so be sure to come down so you can say you were there THE NIGHT JAZZ CHANGED (or something). … you can read the whole thing here. Finally, as a reward for making it through the above promos, and as a preview for those who didn’t make it to the release show, here’s another tune from that night, the 5/4 harmonic maze called “Leap Year” (also available on CONTEXTUALIZIN’), featuring the talents of Evan Francis, Adam Shulman, Fred Randolph, and Jon Arkin. Enjoy! Ian Carey Quintet: Leap Year from Ian Carey on Vimeo. CONTEXTUALIZIN’ @ ALL ABOUT JAZZ: Two big things going on for our new CD over at All About Jazz this week–first, the album is being featured in a “Listening Party” all this week, which means you can listen to it in its entirety for FREE! Check it out here (if you like what you hear and want to keep listening, pick up your own copy at CDBaby, iTunes, or Amazon). How about that! (I was joking to a friend that I should shorten the quote to: “… like Miles Davis…”) Read the whole review here. Finally, if you haven’t yet, please take a second to become a fan of Ian Carey Jazz on Facebook, to keep up with all the latest gig announcements, videos, and links. Happy Spring! Hi Listeners, and apologies for the long break in posting here. I’m currently in the middle of a 3-month sabbatical and have been hard at work in “the shed,” practicing, listening, and working on new music for my group. (More about that in a moment.) But I’m breaking my radio silence to let you know about two shows coming up in April, both of which I’m pretty excited about. Finally, here’s some video from an impromptu show last week at the Parc 55, where I filled in for Betty Fu while she recuperated from a little under-the-weatherness. 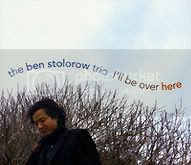 It features me, Noah Shencker on bass, Adam Shulman on piano (unfortunately out of the frame) and the favorite improvising vocalist of everyone I know, Lorin Benedict on the microphone. The tune is “Just You…” Enjoy! I may have mentioned before that I’ve been sitting in pretty regularly lately with the excellent vocalist Betty Fu, who performs on Thursdays and Fridays at the Parc 55 Hotel in downtown S.F. I enjoy playing with singers, and don’t get to do it very often–plus she usually hires great rhythm sections, so it’s a win-win. Anyway, a few weeks ago, Betty decided to give videography a try as well, filming us with her cameraphone during an instrumental. It turned out pretty well, I think. The short video is below–it features myself on trumpet, Adam Shulman on piano, and Noah Shencker on bass. The tune is “Out of Nowhere.” Enjoy! Via Rifftides, Doug Ramsey’s excellent blog, here’s some incredible recently unearthed footage of the legendary Clifford Brown appearing on the Soupy Sales (of “send little green pieces of paper” fame) television show. Clifford was one of the great bop trumpeters of all time during his short career, which ended tragically early when he was killed in a car accident at the age of 25. As I became interested in more modern players, I drifted away from Clifford for a few years, but recently began listening to him again—I particularly like his “West Coast” album, Jazz Immortal (which can be found in this boxed set), and the beautiful Clifford Brown with Strings. Although I always felt that Clifford’s delivery—that is, his vibrato, phrasing, etc.—was a little bit over-expressive for my tastes (just a matter of subjective personal preference, of course), his line construction, harmonic vocabulary, and overall phenomenal chops are unparalleled and should continue to inspire trumpeters (and improvisers on all instruments) for years to come.